In Cairo, Tensions Still High As 'Die-Hards' Continue To Protest : The Two-Way The crowd in Tahrir Square is much smaller today. Police have fired tear gas again in an effort to disperse those who are angry about President Mohammed Morsi's decrees giving him more power. Much larger protests may resume, though, on Friday. 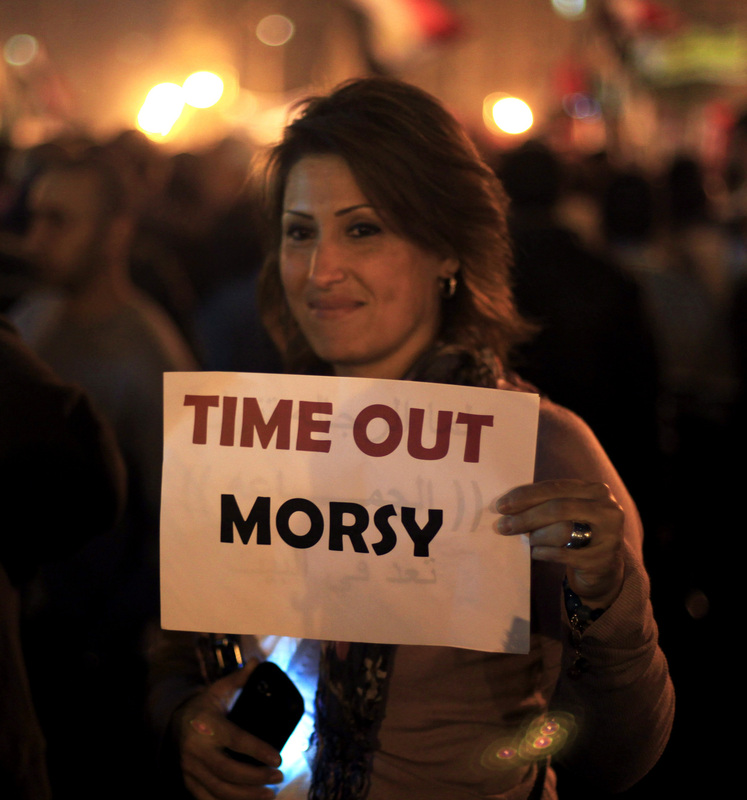 This protester in Cairo's Tahrir Square last night had a message for Egypt's president. Police have fired tear gas again in Cairo's Tahrir Square as authorities try to disperse several hundred protesters who are angry over President Mohammed Morsi's controversial grab for more power. The crowd is much smaller than Tuesday's, according to NPR's Soraya Sarhaddi Nelson, as well as correspondents from other news outlets. Al Jazeera corresondent Hoda Abdel-Hamid, reporting from Cairo, "said that there was a huge difference between Wednesday and Tuesday's turnout, which she said was a huge success for the opposition in terms of the amount of people they were able to rally." "Today, you have those die-hards who say that they will stay in the square until the president retracts its constitutional declaration," she said. As Soryaya added on Morning Edition, even though many protesters have vowed to stay in Tahrir Square until Morsi's decrees are rescinded, "as is often the case here, few followed through." Still, organizers are calling for another large protest on Friday. And on the other side, the Muslim Brotherhood that supports Morsi has "said it was capable of mobilizing 'millions' " to counter the opposition, the BBC says. Meanwhile, according to Reuters, "senior judges have been negotiating with Mursi about how to restrict his new powers, while protesters want him to dissolve an Islamist-dominated assembly that is drawing up a new constitution and which Mursi protected from legal review. Any deal to calm the street will likely need to address both issues. But opposition politicians said the list of demands could grow the longer the crisis goes on. Many protesters want the cabinet, which meets on Wednesday, to be sacked, too." Reuters just added that two of Egypt's top courts have suspended work to protest Morsi's decrees. Note: We're following Associated Press style on the spelling of Morsi's name. Other news outlets, such as Reuters, do not.